The CodeXplorer plugin is one of the first publicly available Hex-Rays Decompiler plugins. We keep updated this project since summer of 2013 and continue contributing new features frequently. 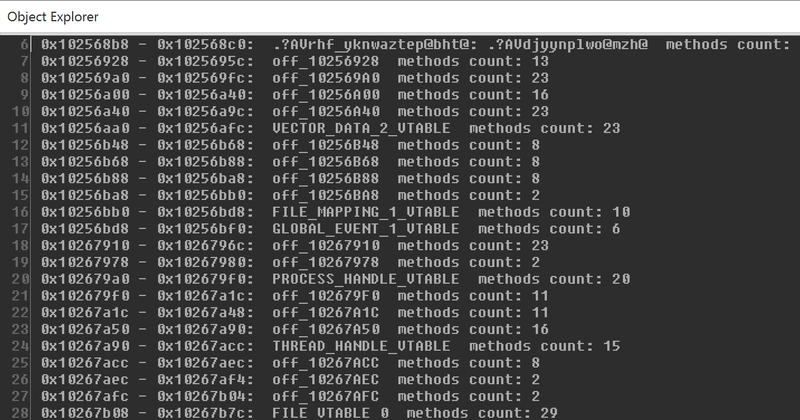 Also most interesting feutures of CodeXplorer have been presented on numerous security conferences like: REcon, ZeroNights, H2HC, NSEC and BHUS. Supported versions of Hex-Rays products: everytime we focus on last versions of IDA and Decompiler because trying to use new interesting features in new SDK releases. It's also mean we tested just on last versions of Hex-Rays products and not guaranteed stable work on previous ones. Why not IdaPython: all code developed on C/C++ because it's more stable way to support complex plugin for Hex-Rays Decompiler. Supported Platforms: x86/x64 for Win, Linux and Mac. The reconstructed structure is displayed in “Output window”. Detailed information about type Reconstruction feature is provided in the blog post “Type REconstruction in HexRaysCodeXplorer”. 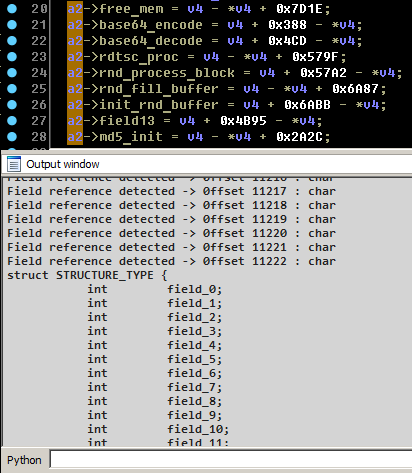 Also CodeXplorer plugin supports auto REconstruction type into IDA local types storage. Virtual function table identification - automatically identifies references to virtual function tables during type reconstruction. When a reference to a virtual function table is identified the plugin generates a corresponding C-structure. 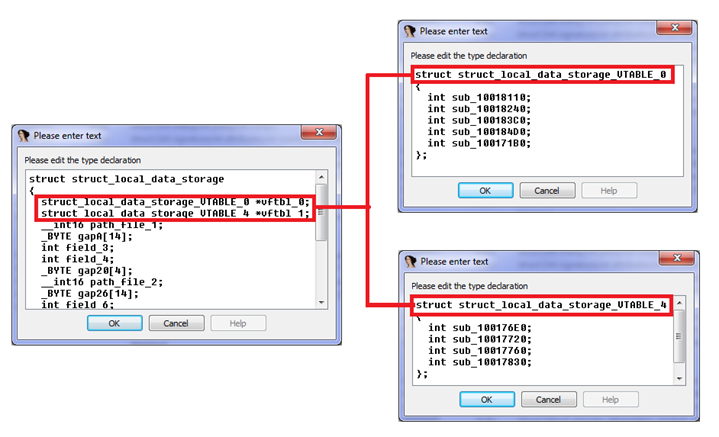 As shown below during reconstructing struct_local_data_storage two virtual function tables were identified and, as a result, two corresponding structures were generated: struct_local_data_storage_VTABLE_0 and struct_local_data_storage_VTABLE_4. 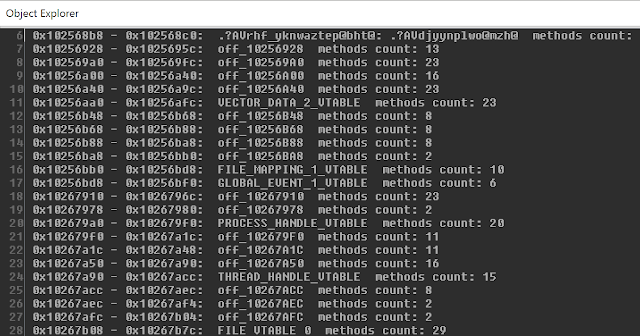 Extract Ctrees to File – dump calculate SHA1 hash and dump all ctrees to file. Extract Types to File – dump all types information (include reconstructed types) into file. 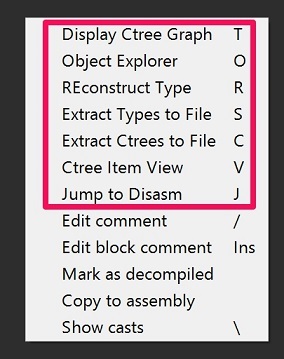 Jump to Disasm - small feature for navigate to assembly code into "IDA View window" from current Pseudocode line position. It is help to find a place in assembly code associated with decompiled line. Shows cross-references list by click into menu on "Show XREFS to VTBL"
Batch mode - useful feature to use CodeXplorer for processing multiple files without any interaction from user. We add this feature after Black Hat research in 2015 for processing 2 millions samples. 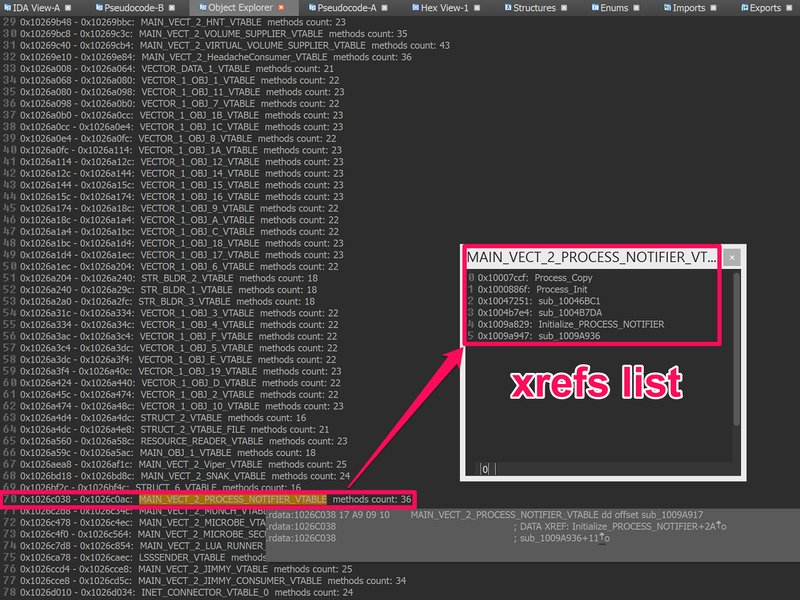 The Mac makefile might need some hand editing, pull requests welcome!